Copyright is never dead. It is not even past. Simon Hopkins and Sarah Turner (who I consider to be friends, not just “people I know through work”) have been commissioned by OFCOM to do a piece of consultancy work on the value of user generated content. “In particular, we will help them to understand the importance of UGC to UK society and its economic impact, both now and 10 years hence. Sensibly they are asking for contributions for people who actually make user generated content – bloggers and such. So if you are interested in saying something go to their blog and maybe write something for them or talk to them or tweet them. This may be a more sensible use of your time that reading what follows which shouldn’t really even be called notes, more like “venting” or a stream of consciousness. Still I wrote it, and in the spirit of UGC I’m publishing it. I never liked the word “user”. Sounds like a heroin addict. I am not a “user”, I am free man. Users are just people. All people have a creative instinct. Some are more creative than others. If they are really talented they can make a living out of their creativity. Most don’t. Some very creative and talented people/artists that I like didn’t make their living out of their art. Williams Carlos William was a doctor. Charles Ives made his money out of his life insurance. How much of a living do Mark E Smith or Kristen Hersh actually make? Enough to support themselves and dependents? More than a doctor, an insurance salesman? The music industry may not be best guide to the future of user generated content or the impact of digital media. Music has always been social currency. The era of sheet music, records, CDs that you have to pay for may come to be seen as a small blip in the long history of an art form where live performance is what people might pay for and the actual physical objects that contain music are just swapped around for free. The canon in both rock/pop (folk music really) and classical exists as a kind of menu to help you buy things and gain social currency. You don’t need it so much if you don’t have to buy them. Film and TV are very different. It takes a lot of people and a considerable investment to create a really convincing and exciting car chase. Beethoven’s 3rd Symphony is rightly regarded as one of high points of Western culture. 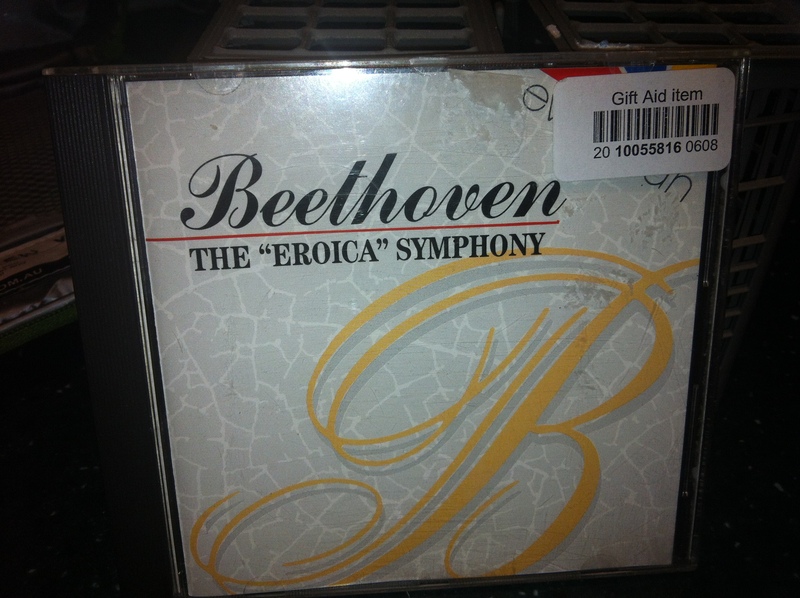 This CD was one of my Xmas presents – bought second hand from an Oxfam shop. And all the more loved because of the person who bought it for me. Note “Gift Aid” sticker in top right. Can you put a “value” on “love”? How many units? “Stumbling and Mumbling” in a blog post called “David Bowie and Consumption Capital” attempts to put a value on consuming now to store up happy memories for later (hat tip to @diane 1959). Even if economics is an art rather than a science putting a number on love seems at the edges of credibility. I ran community/UGC site h2g2 for the BBC in the period up to it’s transfer back to it’s community and off bbccouk. I loved it. Most people in the BBC didn’t. That emotional response I had was a very strange one – the seemed almost like the emotion was generated not just by the people or the content or the navigation but somehow was captured in the software (DNA). The technical team seemed to love the software as much as I loved the site itself. Was the love expressed by the community in it somehow captured in the technical underpinnings of the site? Can you put a value on love? But with my unemotional BBC hat on the trouble with h2g2 was that some of the content on it was as good as the paid professionals of BBC staff could make while some of it wasn’t. This set up a cultural tension where the good stuff would make BBC people nervous about amateurs being on their terrain so the not so good stuff would give some an opportunity to say “the BBC shouldn’t be doing this. It doesn’t generate enough value”. The h2g2 experience told me that user generated content is not cost free. There’s the cost of running the technical platform, the cost of employing full time staff to run the community and the editorial process. UGC is not easy to do well. My guess is that running a UGC site ends up being just as expensive as employing professionals. Mumsnet took a while to get out of the back bedroom into a small business. Mumsnet would make a good case study. Crowd sourcing projects are literally over valued. Crowd sourcing data (e.g. Musicbrainz) works better than crowd sourcing content. Is this because inputting data is easier? Is poor data better than no data at all so the quality of data can be lower? Poor quality content is worse than no content at all as anyone who has sat through a bad half hour of TV sitcom will tell you: it’s 20 minutes of your life you will never get back. This entry was posted on	January 14, 2013 at 8:47 pm	and is filed under Uncategorized.